Running back pain is often a result of either flat feet or a mechanical imbalance. When you have flat feet and you do not have the right running shoes the shocks of the constant pounding on the road will not be absorbed sufficiently. This can, over time, cause back pain. Likewise, when you do not have the right posture and maintain this constantly during your running, the stress on your back will eventually cause back pain. it is therefore of utmost importance that you make sure that you have, in addition to your running program, a core strengthening program. Spend some time each week on abs and back exercises, pilates and/or leg strengthening work. This will do miracles for your running performance and it will help prevent lots of injuries. Stop or Continue Running With Your Back Pain? What should you do when you have been running and are now experiencing back pain? It really depends on how much back pain you have and it was caused by running in the first place. Sitting still puts pretty much as much stress on your lower back as running does. Obviously you should try to find out what caused the pain and take measures against it. when running is too painful, you may want to do some cycling or swimming instead. Find out what works for you. It is good to remain active while your back heels so you maintain fitness and you keep your motivation. If the running back pain is intense and you are looking for fast relief, cut down on any uphill running and long distance runner. Cross-country runners frequently experience back pain. When you run uphill, your body is forced to make postural changes. This places a greater demand on your back muscles, so they will begin to show the stress in the form of pain. Most runners with running back pain can find relief by applying damp heat, using contrast hot baths, heat rubs, and time in a steam room. Most of these treatments are effective in relieving lower back pain. If your back pain is serious, you need to visit a doctor to determine if you are suffering from something such as disc deterioration. There are conditions that may require surgery. Sometimes a visit to a chiropractor is necessary in order to properly align your spine. 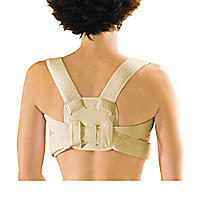 This over-the-shoulder brace provides firm, comfortable support to help relieve your back pain. This posture corrective brace gently holds your shoulder and helps you to stand straight. Click here for more information about this posture corrective brace. This product is recommended for back pain. This NASA-invented thermosensitive adjustable cushion uses your body heat to provide contouring support and thus help to relieve pressure on your spine caused by disjointed vertebrae. Click here for more information about this Thermo Sensitive Memory Foam Seat Cushion. These special custom shoes are designed to help improve your posture and gait, while relieving pressure on joints, and thus alleviate your back pain. 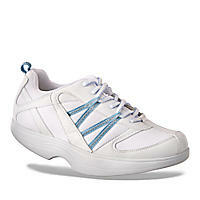 This innovative physiological shoe provide the benefits of Tai Chi "balanced walking". Inspired by the ancient balanced movement of Tai Chi to improve posture, reduce stress on back and joints, tone muscles, increase flexibility and enhance your circulation. Back strengthening exercises are always a good idea whether you are currently experience back pain or not. Having strong abdominal muscles is important as well. A strong abdomen will properly support your back, which in turn will decrease any lower back. Using orthotic insoles is sometime enough to have a positive effect on relieving running back pain. Remember if the running back pain is intense or prolonged visit your doctor for a proper diagnosis.